There really is a technique to using coupons if you want to get the items you need, for free or really cheap. It takes a bit of practice, but I’m sure you’ll have fun trying! After all, saving money is fun! Let’s get going on the secrets that will make you a savvy coupon user, shall we? Start out by gathering only a couple of newspaper inserts (SmartSource and Redplum)or ordering the coupons that interest you from Save.ca, Websaver.ca and Brandsaver.ca. Organize them into a small coupon organizer, so you can easily find the coupons you need, when you need them. Are you ready for the number one secret to maximizing your coupon savings? Use your coupons when an item hits a rock bottom sale price. You want to be looking for items that are a good price before coupons even come into play and, of course, items that are also liked by you and your family. How do you find the sales? Check out your weekly store flyers that come in your local newspaper or find the store flyers online. Start making a shopping list with the deals you can use your coupons on. 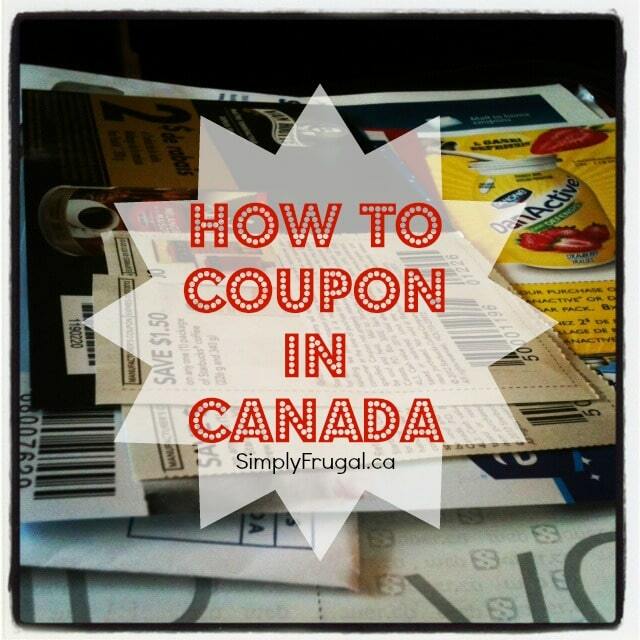 Every Friday, I highlight the best coupon deals in the Coupon Match-ups for Walmart, Shoppers Drug Mart, Safeway, Save On Foods, Sobeys (West) and Real Canadian Superstore (West). I try to make it as easy as possible for you to save your money and use your coupons! Once you’ve become more comfortable with matching your coupons with deals, start collecting more coupons from some of the coupon websites I’ve outlined in this post. Many stores in Canada offer a price match guarantee. They’ll match the advertised sale price of any competitive retailer as long as it is the exact same item and in the current sale period. They’ll even accept coupons on top! Read our full Price Match to Save Money and Time article here for the full details on how to price match. Stores run sales in a cyclical manner. The cycles last anywhere from 6 – 12 weeks. Sometime during the sale cycle, any particular item will be at its highest price and at its lowest price. You’ll want to use your coupons when an item is priced at its lowest. I would recommend you start a price book to track your store cycles. Use a small notebook to record the prices of things you buy most often each week for 6 – 12 weeks. You’ll start to see when you should stock up on the items you need. Couponing takes a lot of time if you’re going to hit up every possible deal you can muster. Time is money. Instead, I recommend that you focus on the best deals that week for the items you need. For example, if you already have 10 sticks of deodorant but are nearly out of laundry detergent, prioritize the laundry deals over the deodorant deals. I’ve said this many times, but what you spend is definitely way more important than how much you save. A 55% savings might be impressive, but the 45% you actually spent is what matters the most, since what you spend comes out of your pocket! If you’re consistently going over your grocery budget every week, by trying to save money on items you may not necessarily need, you’re pushing yourself farther away from any financial goals you have set for yourself. Stick to your grocery budget, even when that means passing up good deals, and you’ll see your bank account grow and your debt get smaller! What are you tips for maximizing your coupon savings? What are your favourite deals to snap up? I use a zippered binder that I picked up from Walmart. You can see the details of my binder in this post: http://simplyfrugal.wpengine.com/2011/06/my-new-coupon-binder-system/ Hope that helps! Same thought as Leslie…what are the rules on stacking? What I REALLY like is being able to stack coupons. Can you give more advice regarding that? Also, how do you stack with the B1G1F coupons? Thanks!